Has Trump Embraced The ‘Lukewarmer’ View Of Climate Change? One climate scientist thinks Trump might hold a “lukewarmer” view on global warming. “Lukewarmers” see global warming as only partially man-made and humanity’s role in temperature changes is largely exaggerated. “[H]e really gave what I think is the basis of the lukewarm argument,” the scientist said. President Donald Trump’s recent climate change comments has one scientist wondering if the president has embraced the “lukewarmer” view of man-made global warming. Climate scientist Pat Michaels said Trump’s most recent remarks suggest the president has become a “lukewarmer” — those who see global warming as only partially man-made and humanity’s role in temperature changes is largely exaggerated. Trump may have even been briefed on Michaels’ 2016 book “Lukewarming,” the scientist suggested. Michaels said Trump recently echoed arguments made in his book about the uncertainties and political motivations in climate science. “He said it’s not a hoax and he really gave what I think is the basis of the lukewarm argument, which is there is some effect, it doesn’t appear to be as large as it is forecast to be, which isn’t much difference than he said,” Michaels said. 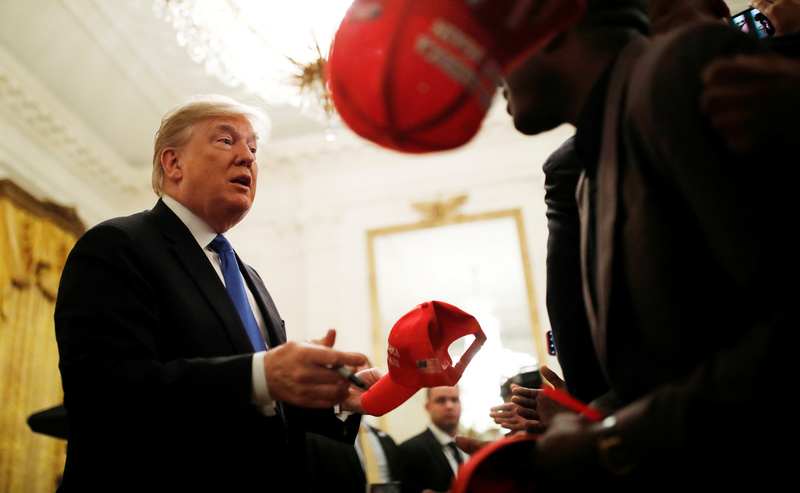 U.S. President Donald Trump signs “Make America Great Again” hats as he speaks with attendees after the president delivered remarks at the “2018 Young Black Leadership Summit” in the East Room of the White House in Washington, U.S., October 26, 2018. REUTERS/Carlos Barria. However, days later, Dessler tweeted out that he has been “encouraging [his] students to vote” to determine how much more the world will warm. Trump largely opposes policies to cut carbon dioxide emissions. I’ve been encouraging my students to vote. This is what I tell them: they’re voting to determine whether we’ll be in the top row or the bottom row. Michaels told E&E News he’s glad Trump didn’t call global warming a “hoax” and that the president didn’t completely rule out a human element to global warming. 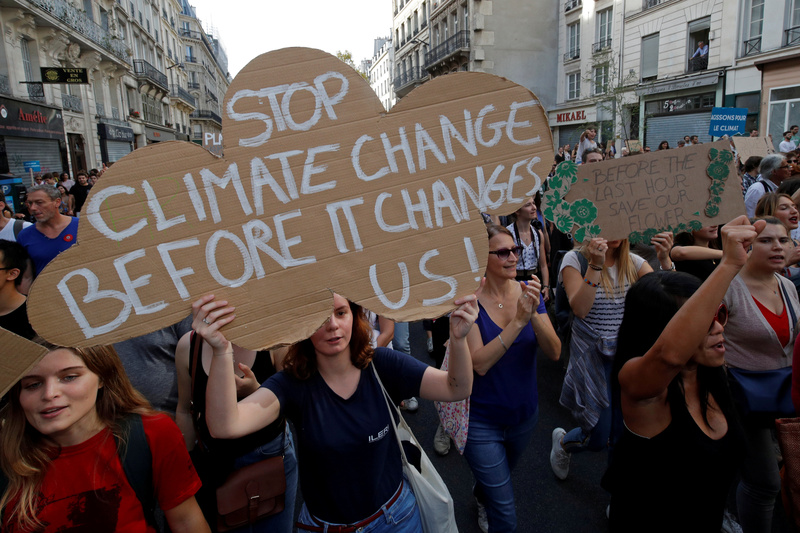 FILE PHOTO: Protesters march to urge politicians to act against climate change in Paris, France, October 13, 2018. REUTERS/Philippe Wojazer/File Photo. Michaels is among a group of scientists critical of government climate models, claims that extreme weather is getting worse and oppose many regulations to make energy more expensive. Aside from pointing out flawed projections and data, so-called “lukewarmers” are also critical of the government funding and the lack of accountability in the field of climate science, especially when it comes to flaws in climate models. “So it’s the scientist, not the science that’s determining how much it’s going to warm,” Michaels recently told conservative talk show host Mark Levin. “A lot of people don’t know this, but it happens to be true,” he added.